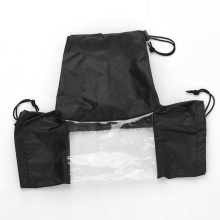 Standard waterproof rain cover for DSLR cameras & lens. Can protect and shield your camera and lens from rain, snow, fog, dust, etc. Made from high-quality waterproof nylon material, and the transparent window allows you to view the LCD of your camera clearly. Dual sleeves design enables you to controls your cameras easily whether holding or tripod mounting your camera. With this waterproof rain cover, you can take wonderful pictures in any weather conditions. The camera and tripod showed in the pictures are not included.